Latest review of “Jupiter Meets Uranus”…. from Dawn Bodrogi at The Inner Wheel…. Undoubtedly for me one of the the finest astrological discoveries of 2009 was a new blog called The Inner Wheel by accomplished and experienced astrologer and writer Dawn Bodrogi. I read through her site’s extensive book list last autumn, and emailed her on discovering that I either owned or had read every single book on that list! Thus began a fruitful exchange and a new astrological friendship which I very much hope will continue. At the end of 2009 she read my newly published book “Jupiter Meets Uranus”. Two days ago, feeling rather gloomy because a bout of tendonitis is restricting my writing capacity and time, I was immensely cheered up by finding a terrific writeup of my book on her site! Here are some extracts from what she wrote – to read her post in full, and be enticed by more of Dawn’s excellent writing, follow the link at the foot of this post. Over to you, Dawn…. “….in order to give more exposure to good astrological writing and to spread the word about what’s available out there, from time to time I’m going to feature a book that I think is well worth the read for people who are impassioned about astrology, its history, and its future direction. These aren’t book reviews, per se, but I will be pointing out the worthwhile and interesting books that contribute in some way to astrological knowledge. In short, books that help us to think astrologically, and therefore make us better astrologers. Worth a look for that alone. 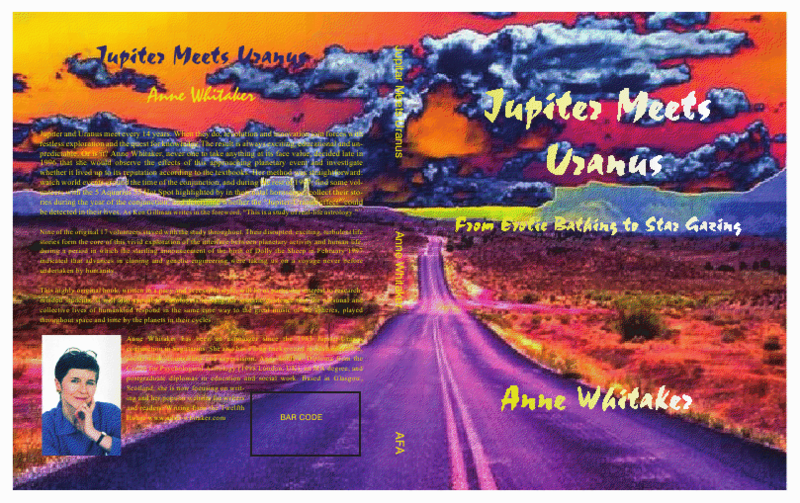 I’m pleased to say that the first featured book is Jupiter Meets Uranus, by Anne Whitaker. Anne is an astrologer and writer living in Scotland, and is a graduate of The Centre for Psychological Astrology in London, the astrology school Liz Greene founded with Howard Sassportas. Her blog, Writing from the Twelfth House, is always a great read, and full of interesting diversions. I recommend her posts about her own paranormal experiences, to be found serialised on her new blog “Wisps from the Dazzling Darkness”. Jupiter and Uranus form a conjunction every 14 years. What happens when the planet of higher learning, adventure and exploration joins forces with the revolutionary spaceman? Well, Anne Whitaker decided to do her own exploring. The answers are not unexpected, but surprising in their accuracy and timing. What happened under a Jupiter/Uranus banner? Ponce de Leon discovered the “New World.” Mary Shelley published the story of Frankenstein (still a cautionary tale for our times), a man walked on the Moon and Dolly the Sheep was cloned. And that’s only for a start. Anne’s book takes us through the Jupiter/Uranus high points (and inevitable low points) in history, and the chapters read like a novel. Her scholarship is first rate, and her observations insightful. The book is well worth a read simply for her descriptions of Jupiter and Uranus, and the introduction (do not skip) takes us on a journey through the mythology of each planet. …When you get to the end of this book, you will feel that you know both Jupiter and Uranus a lot more intimately, and will understand more clearly their function in a chart.